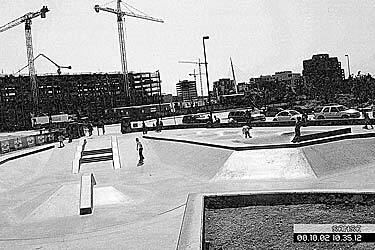 NATURE OF GROUP: Citizens of towns or cities who fund, through taxation, state, county, or city funded and operated skateboard parks. INCIDENCE OF SOCIOMETRY: False Sense of Security. A means of creative expression. A piece of athletic equipment. A pastime is allowed to develop that, because of its unique combination of qualities, attracts societies most promising youth, hones their creative self expression, keeps them in peak physical condition, allows them complete freedom of movement, and arms them with clubs. Society is, in turn, allowed to continually eject the pastime participants from public and private property, cite them, arrest them, and deride them as noisy, dangerous, and destructive. 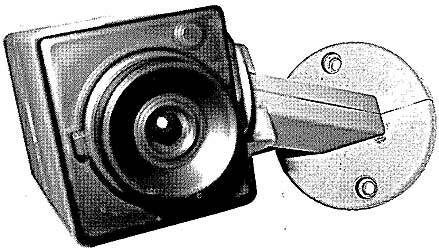 Additionally three simulated security cameras were installed. Views from each are pictured. All were removed by the city. 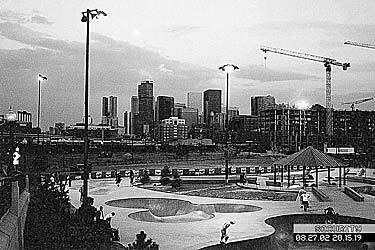 SKATEBOARDING IN THE UNITED STATES ROUGHLY 1985-1995. 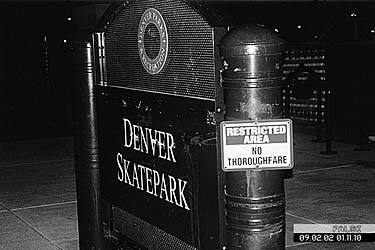 SKATEBOARDING IN THE UNITED STATES ROUGHLY 1995-PRESENT. 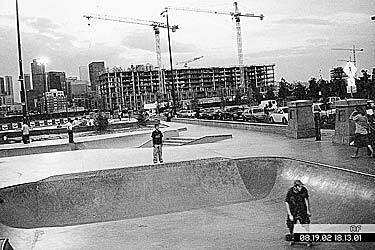 Build killer public skate parks in every town. Provide a place that no local brick bank or concrete bench could hold a candle to. Make them free. Limit rules to common sense regulations like those that pertain to jungle gyms and public basketball courts. Make the rails a foot lower for the juvenile delinquents. Lure the older unreformable set with cloverleaf and capsule bowls poured of the smoothest concrete commercially available. Effectively entice a legion of problem cases to hang out in a socially sanctioned, municipally funded, centrally located, and easily monitored environment. Keep them pinned in by their own desires. Go to the skate park in any U.S. town. Look at the old-school vert dogs. They’re whooping it up, occasionally self-medicating in the privacy of their cars, and complacently settling into routines of adulthood. The wives and Jr. come down to watch on Saturdays. Look at the new-school hip-hop skaters approaching a ledge or bar, content to repeat a sequence over and over. Their cloths are baggy yet clean. Skate brands are substituted with more affluent designer and corporate logos. Shirts are collared. Look at the little kids – the future of skateboarding. Helmets and pads all around. Mom reads a book at the end of the hip-hoppers ledge. Skaters and roller-bladers commingle. Now, take a second look at both old and new school. Vert-dogs and hip-hoppers. Note the occasional glance toward the Downtown skyline, the frequent blank looks, long periods on the bench. Now look again at the little ones. The kids not yet in a school. They are content with their bike helmets, their alterna-mom, and their roller-blader brother. They know and follow the rules. They might as well be playing touch football! They are and will continue to be followers… Problem Solved.